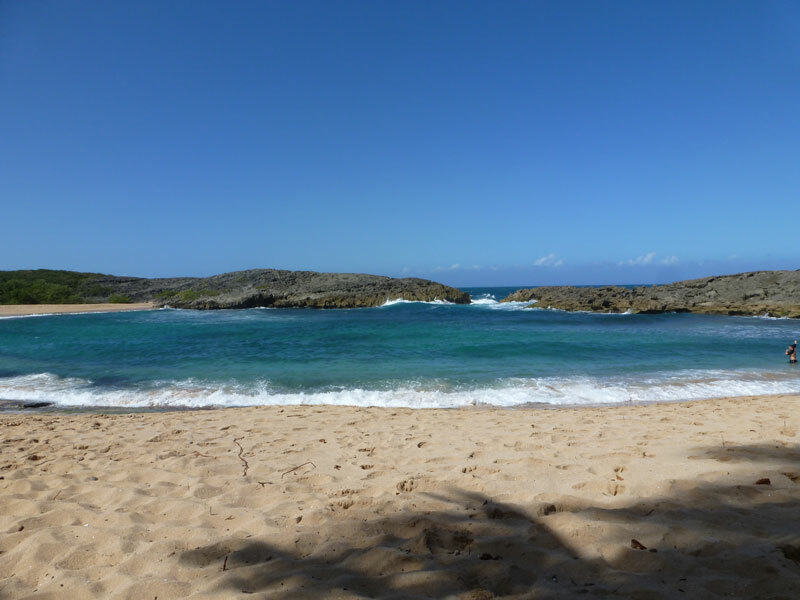 Playa Mar Chiquita, or the beach of the small sea, is located near the eastern end of the long ridge of eolianite exposed on the coast of Manatí in northern Puerto Rico, about 40 kilometers (25 miles) west of San Juan. Eolianite is a fossil wind-blown deposit that turned into a sedimentary rock. In this case, the ridge is an old line of sand dunes that formed at the back of an earlier beach when sea level was lower during the Ice Age. Water seeping down through the carbonate sand of the dunes deposited a natural cement of calcium carbonate, turning the dunes into rock. Playa Mar Chiquita formed after wave erosion opened a gap in the eolianite ridge and water entered the basin forming a small lunate embayment. Today, the gap measures about 24 meters (80 feet) wide. C. A. Kaye described the embayment “a small lunate resonating basin” in his classical work Shoreline features and Quaternary shoreline changes Puerto Rico (1959). Kaye suggested that the basin was almost completely excavated by resonating waves entering the embayment. He also observed that the waves inside the basin are of considerable height. Any visitor trying to swim in the basin today will observe the same phenomenon! Kaye interpreted the large size of the waves as the result of the backwash meeting the incoming waves at their breaking point, building up the size of the waves. 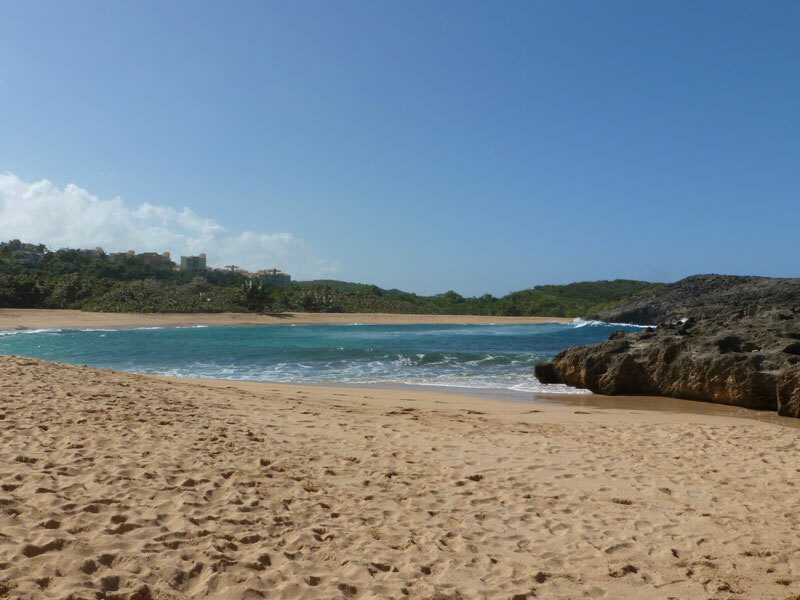 Playa Mar Chiquita was once a popular secluded beach with a beautiful setting of palm trees, golden sand, and the imposing ridge of pitted eolianite that serves as a contrasting background for the blue clear sky, blue water, and sand. 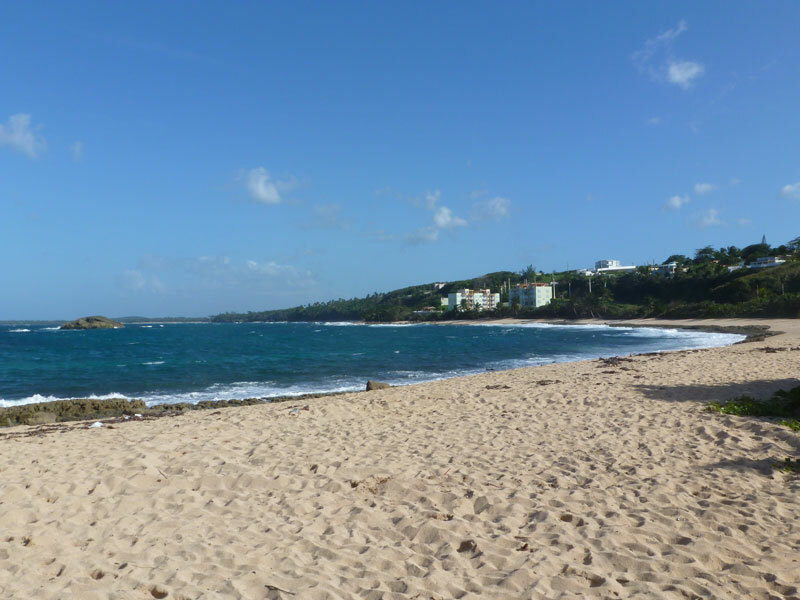 Today, Playa Mar Chiquita is still a gorgeous beach, but it is no longer as secluded as it once was due to the major urban development occurring on the coastal plains of Puerto Rico. However, the beach’s popularity has not declined. On any given day of the week you can see a few family picnics, visitors playing beach sports, or simply enjoying the landscape and sunbathing. 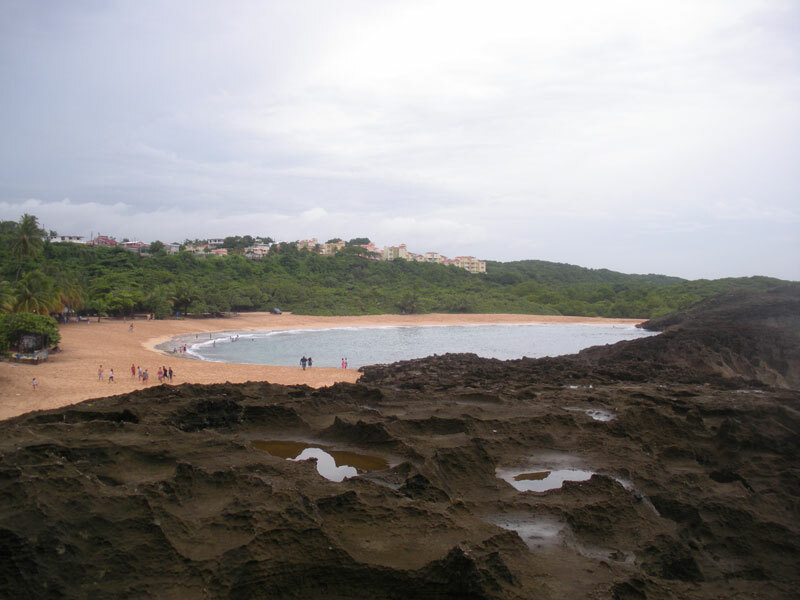 One popular activity is to climb and explore the eolianite ridge that forms the rocky headland of Punta Mar Chiquita, on the northeast side of the beach. Hikers can see coastal processes in action as they experience the wave energy coming from the mighty Atlantic Ocean being expended on the rocks, and spraying the ridge, causing erosion and karstification that form interesting rock shapes due to the dissolution of the eolianite. The eolianite of Playa Mar Chiquita is intensely pitted, with spikes and narrow sharp edges dividing the pits and pools. Cross-bedding in the calcareous sandstone forming the eolianite is easily observed on the edges of the ridge. Tidal terraces are a common feature on the ocean side of the ridge. 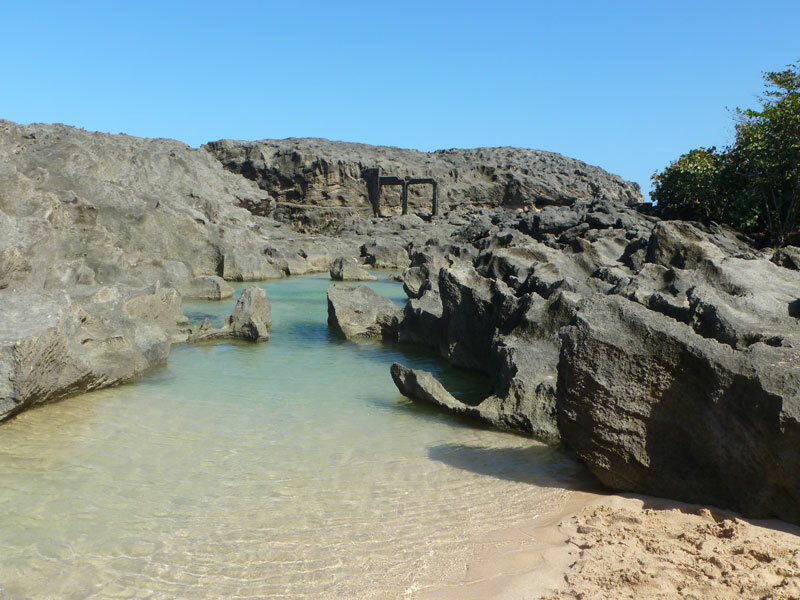 Occasionally, water from the small basin, and water sprayed over the eolianite, reaches the back edge of the eolianite ridge, forming shallow, warm pools of calm seawater that are perfect for kids and adults looking for a relaxing environment away from the high waves of the embayment. Playa Mar Chiquita also offers a few food kiosks and carritos operated by local neighbors that sell beverages, pinchos and frituras for the delight of visitors. Trees and uvas playeras provide much needed shade and the limestone geologic formations to the south expose the typical geomorphology of the Northern Karst Belt. The beach is off route PR-648 between the Reserva Natural Hacienda La Esperanza and Laguna Tortuguero.